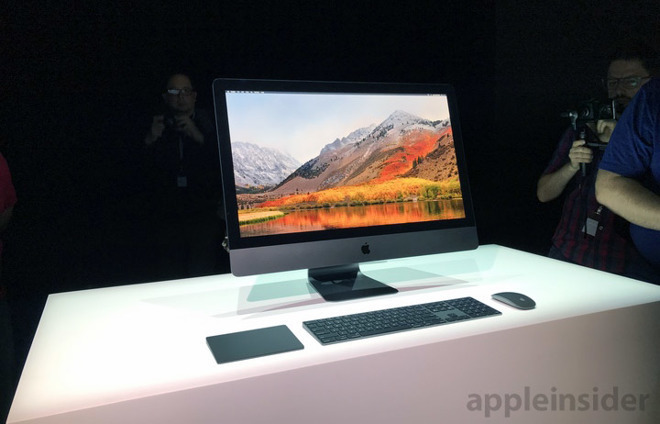 A report on Thursday suggests Apple's forthcoming iMac Pro all-in-one will run Intel's server-class "Purley" Xeon platform, as well as a Secure Enclave Processor similar in function to the ARM-based chip embedded in the MacBook Pro with Touch Bar. According to Pike's Universum, code in the latest macOS 10.13 High Sierra beta release suggests iMac Pro will be Apple's first desktop to feature Secure Enclave integration. Borrowed from the iOS line of products, Secure Enclave Processor technology was introduced to the Mac platform with the MacBook Pro with Touch Bar late last year. Like its iPhone and iPad siblings, the MacBook Pro uses an ARM processor to authenticate Touch ID operations. Today's report notes Secure Enclave compatibility will extend to a variety of system-level hardware and software functions including AppleSecureBootPolicy, ApECID, ApChipID, ApBoardID, ApSecurityDomain, ApProductionStatus and ApSecurityMode. The presence of a Secure Enclave also opens the door to Touch ID access, though Apple did not mention such capabilities when it previewed iMac Pro at WWDC. As for processors, High Sierra code points to the use of Intel's LGA3647 socket, a server-grade component reserved for the Purley Xeon platform. Purley is based on the Xeon E5 and E7 platforms and supports high-end Skylake class Xeon silicon. The information lines up with Apple's promise to equip the desktop with 8-, 10- or 18-core Xeon processors. Entry-level 8-core versions are expected to start at $4,999. Pike's Universum also found reference to Intel's Basin Falls chipset, high-end hardware that supports the chipmaker's new Core X-Series processors. The X299 chipset is interoperable with Kaby Lake-X and Skylake-X parts, the latter of which is being offered with up to 18 cores. Beyond the inclusion of Xeon processors and Radeon Pro Vega GPUs, Apple has said very little about iMac Pro's specifications. The company is expected to provide more detail as the desktop's December launch date nears.